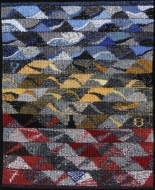 View the tapestries: H: The Woven Word Images. The project. Weave a word or phrase starting with the letter “H.” Start by weaving the “H.” You don’t have to decide what word or phrase until you are weaving. Weave at 8 epi. Use 12 warp threads to weave 1 ½” wide. Decide what you want to weave as you weave. 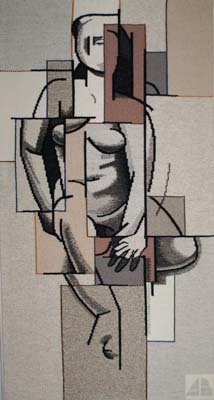 Tapestry is a journey. The idea for the project is Archie Brennan’s. Susan Martin Maffei and Archie Brennan were facilitating a tapestry retreat at Pam Patrie’s Oregon ocean-side cabin. By giving us this seemingly simple project, Archie was getting us ready to learn more and remember what we had already learned from Archie and Susan. I volunteered to coordinate the project and to find some way of showing the tapestries to everyone. Lots of people were interested. Photos of finished “H” words started to come in. I shared them with everyone who signed up on the “H” email list. 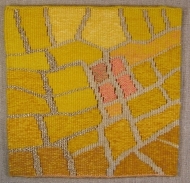 I shared the “H” words on our Facebook group page, “H”, a Journey in Tapestry. ATA agreed to include the project in the Educational Articles. More people asked to join in! I started weaving my word and the brilliance of this simple tapestry task made itself known! I could hear Archie and Susan. 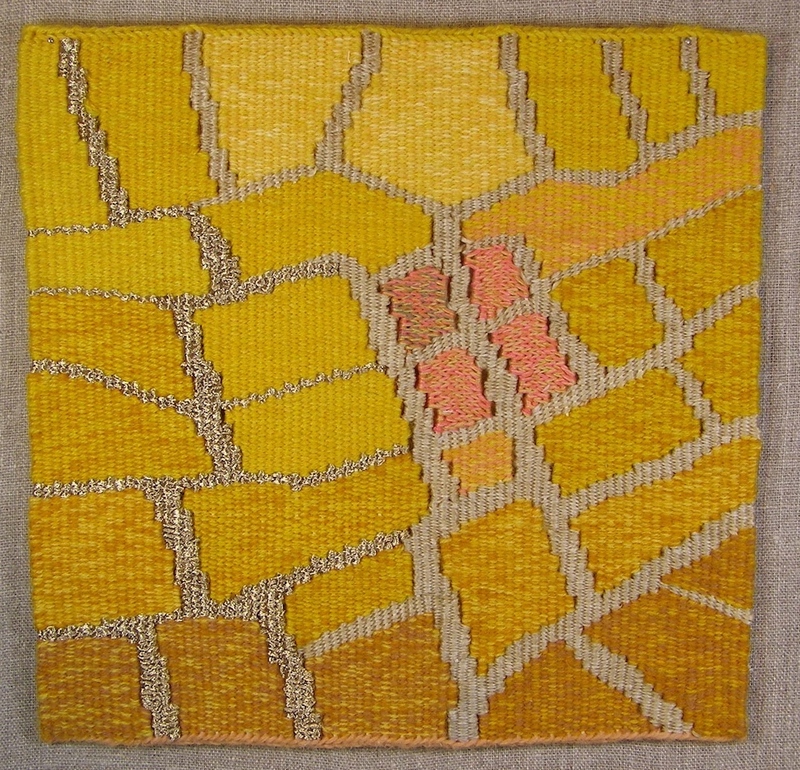 I took a two-week workshop with them in Parksville, BC, early in my tapestry weaving career. Their lessons came back to me as I started weaving my word – all the lessons they have taught me over many years in several workshops! “H” is a non-threatening letter. All straight lines. An easy start. No curves or angles. Many words start with “H.” In English, there is always a vowel after the “H.” If you haven’t decided on your word, no worry. Just weave an “H”, then pick a vowel – a, e, i, o, u and sometimes y. Some people chose words from languages other than English. Starting to weave. Setting up the warp, spacing correctly, heading done, double half hitches, hem or no hem. Lots of decisions. Be aware of negative and positive spaces. This is very important in all tapestry design. You have to weave all of the spaces. Letters really make you look closely at the relationship between positive and negative space. Lots of choices to make. Most people followed all of the rules. A few didn’t. They used extra warp threads. One person who doesn’t weave tapestry used her floor loom because she wanted in on the fun too. One person wove some words with “A” instead of “H.” Read her explanation to understand why. Everyone who wanted to come on this “H” word tapestry journey has been included. We all enjoyed the journey together. Always remembering that tapestry is an open journey. April 4, 2016, on a snowy day in April where Susan and Archie live, New Baltimore, New York. Archie has been weaving. He just cut a tapestry off the loom today. It is the third version of a drawing. He wove it before, almost life size. This version is about 15” x 10” at 9 epi. Archie says that his fingers don’t move as well and are not as efficient as they were. His speed of weaving has slowed down, but he still weaves. What Archie wants us to learn from H: a Journey in Tapestry, is that tapestry does not have to be planned completely ahead of time. It is an open journey. The idea is important – not a complete cartoon. 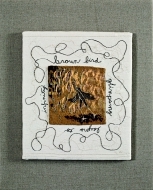 Creating tapestry is a way of thinking. You do not have to follow the design/drawing exactly. Archie likes the creative journey, rather than an imitative process. Archie and Susan were in Oaxaca recently. 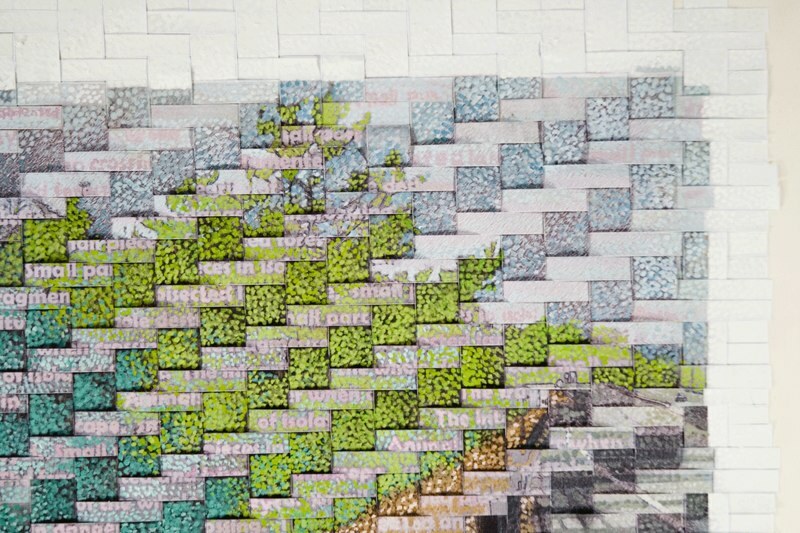 The Textile Museum and the Postage Museum in Oaxaca initiated a project in which people would weave tapestry postcards and mail them to the Textile Museum for a show. This was inspired by one of Archie’s projects. Years ago, Archie wove a map of the world in 72 postcard sized pieces. After seeing a Japanese Airlines map of the world with Tokyo as the center of the world, Archie thought that he could choose anywhere as the center of the world. He took the North Pole as the center of the world and drew his map. He wove the map in 5” x 7” postcards, gave the postcards to people from around the world and had them mail the postcards back to him. The postcards were all mounted between plexiglass so that they could be seen on both sides and displayed at the Chicago Post Office Museum. As part of the Oaxaca postcard project Susan and Archie taught a workshop at the Textile Museum in Oaxaca, so that weavers local to the area would be excited about participating. Archie was intrigued by the architecture at the Textile Museum in Oaxaca and did some drawings there. Archie has always drawn. It is one of the things he does. He has drawn since he was 16 years old in Scotland and has kept it up his entire life. He does weekly figure drawing. The drawings are not for tapestries. They are just for drawing. 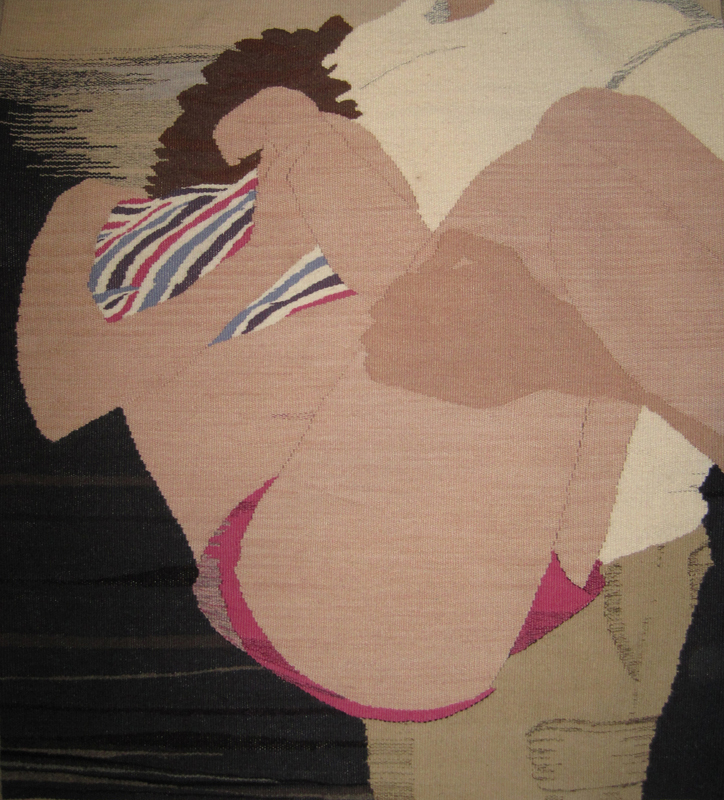 Sometimes his drawings make their way into his tapestries. Archie would like tapestry weavers to remember that tapestry is an open journey. You have an idea, you do some drawings, you might make a cartoon as a guide, and then you weave, being open to ideas as they arise while you are weaving. 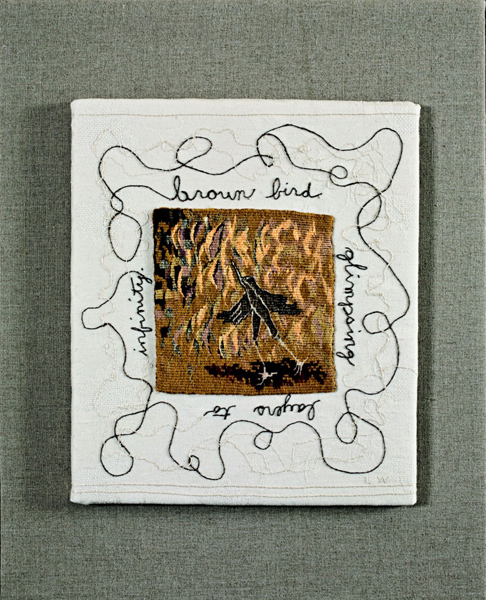 Tapestry is exciting as a creative journey, open to ideas and interpretations as you weave. Tapestry is an open journey. Christine concludes with and celebrates the H Project with a poem (loosely based on one she used to encourage her children to write poetry when they were in grade school).